Agnolo Gaddi was one of the best representatives of the late Gothic style of the late 14th century in Florence. From a family of artists, he was the son of Taddeo Gaddi and brother of Giovanni who was also a painter. Agnolo worked throughout his career in Florence and Prato. While his earliest works reveal the influence of Taddeo, Agnolo soon developed his own style in the 1480s. He ran a large workshop that produced numerous commissions of variable quality. These works, produced by assistants but bearing his name, have resulted in differences of opinion as to his oeuvre. Vasari included an account of Agnolo in his Lives, praising his fresco with the story of Lazarus painted for a Florentine church, and his story of the Holy Cross for Santa Croce, Florence. The present panel, which terminates at the top with a broad, shallow arch shape and which was formerly in the Carlo de Carlo collection in Florence, entered the Thyssen-Bornemisza collection in 1977. Prior to that it was on the Florentine art market in the early 1970s when Boskovits studied it for the first time and attributed it to Agnolo Gaddi, the attribution that appeared when the panel was included in the Florence International Antiques Fair. The four figures in the composition are firmly located against the gold background. Their location follows the traditional scheme with Mary to one side of the cross on the right and Saint John on the left. The Magdalen also occupies her traditional position at Christ’s feet but in this case she is not kneeling to embrace the foot of the cross but lying on the ground kissing Christ’s feet in pious devotion. The slim, elegant form of Christ with its rigorously drawn outline has some parts of the body strongly modelled such as the breast and abdomen, in which a pronounced chiaroscuro is evident. The horizontal shaft of the cross is a striking element due to its unusual length, as is the short vertical shaft with the sign at the top. So short is this element that Christ’s feet are almost at ground level. The figure of Saint John, holding his ample cloak with one hand while he points to Christ with the other, inclines his head to one side in a gesture commonly found in Gaddi’s work. It has been suggested that this small panel, which was originally square in format, would have been the top part of a larger panel with a Virgin of Humility surrounded by saints or a Virgin and Child as the principal theme. The execution of the figures has been compared to others by this artist, such as the Christ in the church of San Martino in Sesto Fiorentino, or the figure of Saint John in his frescoes in Prato. 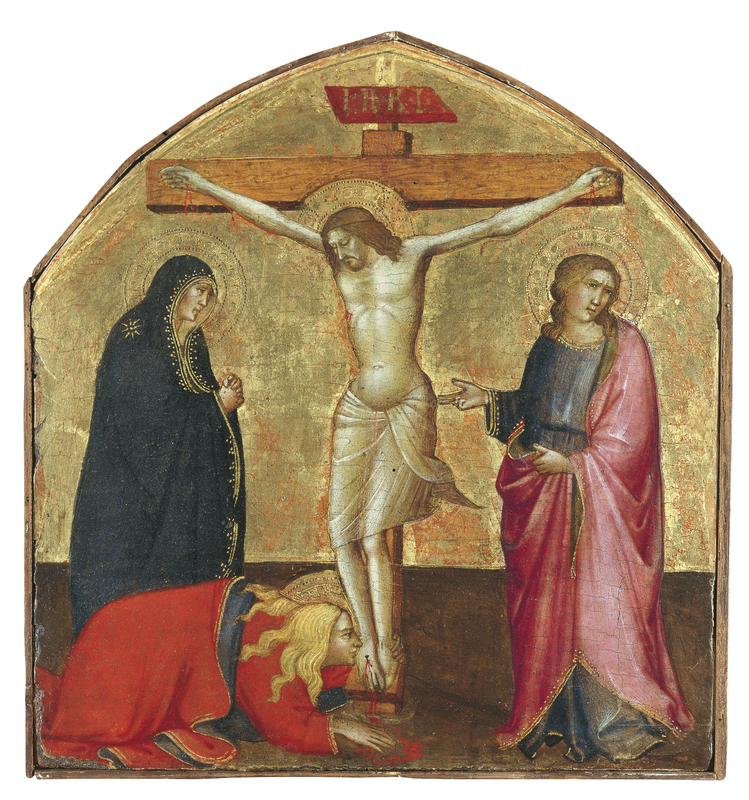 The present Crucifixion has been dated to around 1390.